No doubt you’ve heard the term “we follow best practice”, many times. The implication is that there is an objective methodology that is “best”, agreed upon by a group of operators, who all follow the same methodology, which is, of course, “the best”. After all, there is little point claiming to “follow worst practice”. 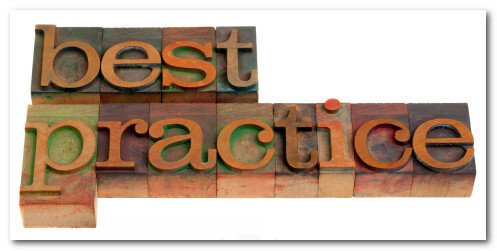 The big problem with the term “best practice” is that it is a nonsense. How do you differentiate your marketing if your process, method, strategy & techniques are backwards looking? If everyone follows an agreed standard of “best”, then everyone becomes just like everyone else, which makes them average, not best. Best Practice is a recipe for mediocrity. Best practice implies “co-ordination”, “acceptance”, and “having stood the test of time”. It’s a secure-sounding phrase. However, it can also be problematic, because the world – particularly the online marketing world – is uncertain and always changing.Restrictive practices can limit adaptation, which can turn practices from “best” to “worst”. Conventional wisdom repeatedly gets thrown under the bus. Experimentation and keeping your wits about you, especially in PPC, can mean the difference between success and failure. You can’t just be as good as your competition, you need to be better. Whatever their best is, you have to be better in order to win. This is not to say there is no such thing as best practice or process. We don’t need to reinvent the wheel each time we do something. For example, it could be considered best practice to use tight, keyword focused groups, as this is an effective way to keep quality scores high, and campaigns focused. In the field of medicine, you want a surgeon who follows “best” practice, rather than deciding to randomly experiment on your left eyeball. You want best practices in medicine, accounting, and insurance. But in marketing it all comes down to testing. In terms of PPC, you can afford to experiment and take risks. No one will die if you push a few boundaries. Why do we create ad groups this way? Why do we research keywords in the way we do? Is this ad copy really the best it can be, or could we try a different approach altogether? Instead, find a site ranked highly and advertise on it. After all, the point is to get traffic/attention, and the top web site might be selling that traffic a lot cheaper than Adwords does. What if you write Adword copy that sounds mad? Does this get more clicks than something than copy that sounds sensible? The problem with keyword research tools is you get the same lists as everyone else. What are other ways to find out what people are interested in? How about identifying your customers and hanging out with them on forums, or Facebook, or wherever. What phrases do they use in normal conversation? Make a list of them. Are you seeing the same phrases over and over again? Do you use small keyword groups? Make large ones. Do you bid during a certain time-period? Change all the hours. Do you bid cautiously? Go crazy. One caution – probably not a great idea to do this with a performing campaign, but try it with a new one. Breaking old habits can lead to fresh insights. Every blog and forum you read – ask “why?”. Many people repeat what they think sounds good, but may have no basis in reality. By definition, those who do very well at something are doing something that everyone else isn’t. They aren’t following the exact same path. Gates, Page, Brin, Zuckerberg – they all did something different. Write your own “best practice”.